Umer: (Talking of A. H. Maslow's Hierarchy, as shown in the diagram.) 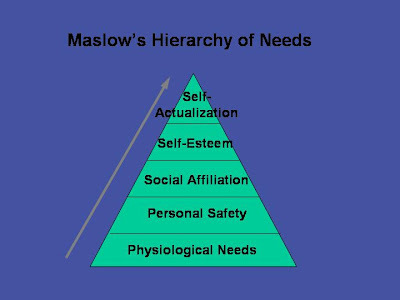 I feel that A. Maslow (or, his hierarchy of human needs) is mistaken when he says that needs, such as of food, etc., are necessary in order to self-actualize oneself or to attain moments of ecstasy and great illuminations. Because in mysticism, such as of Islam or even simple spiritual life (given that the believer is highly motivated for such acts), self-restrain and self-control on 'certain human needs (as shown in the hierarchy)' is unavoidable and necessary! And, like in certain many other conditions. Therefore, what is your reaction to this point I've tried to put here? Moreover, my question to you is, as some scholars have criticized, how do I reach at the level of self-actualization, when I have fulfilled the basic needs of life and I continue to? What process is behind in achieving the penetrable self-actualization? when many of us are ill or feel threatened, thoughts of social position and improvement tend to fade. It's also worth noting that it's a very Western model and hence reflects Western sociological and cultural values. People are people wherever they are and there are common needs, but there are also cultural layers that modulate these. Reaching self-actualization is not a simple process that can be explained. Many seek it and some find it through various means. Some get there through academics and study. Others through contemplation and prayer. Still others by not trying -- just by being. And others again use many combinations. A common factor seems to be escape from the self. When you are focusing on yourself, including, bizarrely, seeking self-actualization (the self is in here), then it is difficult to become one with whatever higher planes of existence there are. To join one thing, you often have to let go of a previous thing. Even the notion of 'thing' may need to be let go as you enter a state where language cannot be. That's very nice, you won't need going outside understanding the concept? Thinking of self-actualization, or to quote poet iqbal, "self-realization", is very attractive. so is sufism, founded on the perennial principles of islam, goes beyond all theories/imagination of maslow, even. i hope you know the rest. 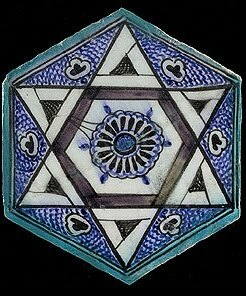 so how did your ancestors did their self-realization (i.e, experiencing ultimate reality)??? and, why does it unsettles you??? Self-actualization is not a 'vocation' that people adopt. Personality is never static, it is always in flux -for better or for worse. If you're able to let that flux happen by going through the painful process of acknowledging and facing up to your shortcomings, thus coming more and more in touch with yourself through self-acceptance, you are a self-actualizer. Most of us are: it is a PROCESS and not an END-STATE.